All Nippon Airways and United Airlines are showing 2-in-1 flights that allow you to spend time in both Tokyo, Japan and Hong Kong for $642 to $688 CAD roundtrip including taxes. vancouver, yvr, flight deals, asia, east asia, tokyo, japan, hnd, nrt, ana, united airlines, hong kong, hkg and all nippon airways. 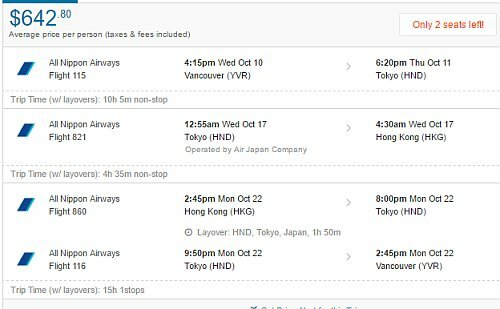 7 Responses to "2-in-1 trip: Vancouver / Victoria to Tokyo, Japan *and* Hong Kong - $642 to $688 CAD roundtrip including taxes"
ANy way to get the same deal without HK stop? You can't completely eliminate Hong Kong and keep the price low, but you can minimize the time spent in Hong Kong down to 1 night. I just added some info to the blog post about doing this, hope it helps! 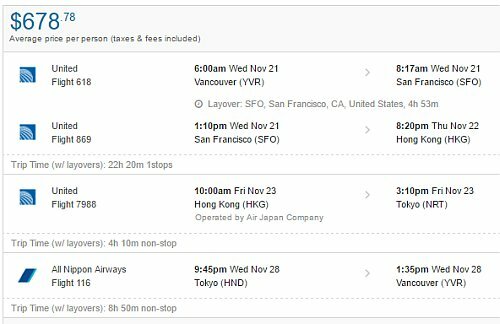 I'm looking for flight to japan so if i buy this ticket (YVR-HND,HND-HGK-HND-YVR for $767), and thinking what if I purposely miss flight to hong kong and catch it from HND then Vancouver? Will airline let people catch plane from stopover airport? Hi C.N. - Unfortunately all airlines automatically cancel the remaining legs on your ticket, as soon as one leg is intentionally missed. So you can only skip the final leg, not one in the middle. Awww thank you so much for reply! Got in on this deal! Was able to find the price first on flighthub. Google flights was also able to pick up the price which provided a link to expedia. Was NOT able to find the price directly on expedia though.